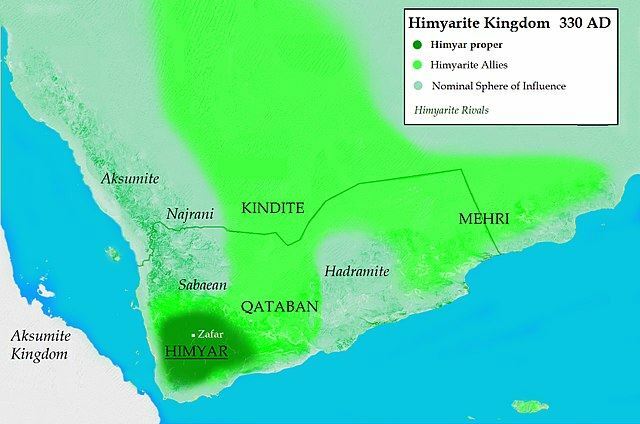 The Ḥimyarite Kingdom or Ḥimyar was a kingdom in ancient Yemen. Established in 110 BCE, it took as its capital the ancient city of Zafar, to be followed at the beginning of the 4th century by what is the modern-day city of Sana'a. Its economy was based on agriculture, and foreign trade centered on the export of frankincense and myrrh. For many years, the kingdom was also the major intermediary linking East Africa and the Mediterranean world. This trade largely consisted of exporting ivory from Africa to be sold in the Roman Empire. Ships from Ḥimyar regularly travelled the East African coast, and the state also exerted a large amount of Influence both cultural, religious and political over the trading cities of East Africa whilst the cities of East Africa remained independent.